If I were to write what I really think of this bishop and the pope who appointed him but I'd have to to to confession. I doubt it will be long until he's a cardinal. "While commerce in the remains of defenseless children is particularly repulsive, we should be no less appalled by the indifference toward the thousands of people who die daily for lack of decent medical care; who are denied rights by a broken immigration system and by racism; who suffer in hunger, joblessness and want; who pay the price of violence in gun-saturated neighborhoods; or who are executed by the state in the name of justice. Cupich's comments are a disgrace. His equating health care, immigration, racism and the economy in this statement is insulting to the souls of the murdered babies and those who have worked in ProLife for decades. His lecturing of John and Mary Catholic is a condescending display of episcopal pride and arrogance. What a pathetic appointment to the Metropolitan See of Chicago. What a return to the past and the Bernardin legacy. We are sheep without good shepherds and some of these are wearing a disguise. O LORD, deliver Your Church and Your faithful! The Circle of Vomitus...it goes like this: Shepherds spew vomitus despoiling the sheep and the Lord vomits them out. Cupich is a piece of garbage. A disgrace to each apostle - even Judas. Yes: even Judas. kill and go free to kill again. and Freight Handler to the Nation. I just saw that he's going to the synod. No surprise here! Archbishop Cupich, the Indecent. This fraud of a Bishop should get kicked out of the Church. He is a Marxist activist wearing a Bishops clothing who never had a Vocation to become a Catholic Priest in the first place. The fraud Blaze Cupich is a disgrace to Christ and the Blessed Virgin Mary. He is not worthy to touch the Holy Eucharist much less Consecrate the Sacred Body and Blood of Christ. He performs with his wicked intentions to give the Sacred and Holy Eucharist to Homosexuals in active Sodomite fake Marriages, to Baby Killer Politicians and to Adulters of the Divorced and remarried. This lunatic does not believe in the real presence of Christ in the Eucharist. Blaze Cupich is a carbon copy of the old Archbishop of Milwaukee the Homosexual Sodomizing Rambert Weakland who cost the Archdiocese of Milwaukee over 21Million Dollars. Another Marxist in a Bishops clothing. Kick Archbishop Cupich the Lunatic out of the Holy Church before Chicago will have to pay the same price and worse for his Anti-Catholicism. Praise Be Jesus and Mary ! Truly disgraceful. I hope the moniker "Blase the Indecent" sticks with him. It is fitting. Blase the Indecent, Blase the Indecent, Blase the Indecent, Blase the Indecent! Shout it from the rooftops, people! 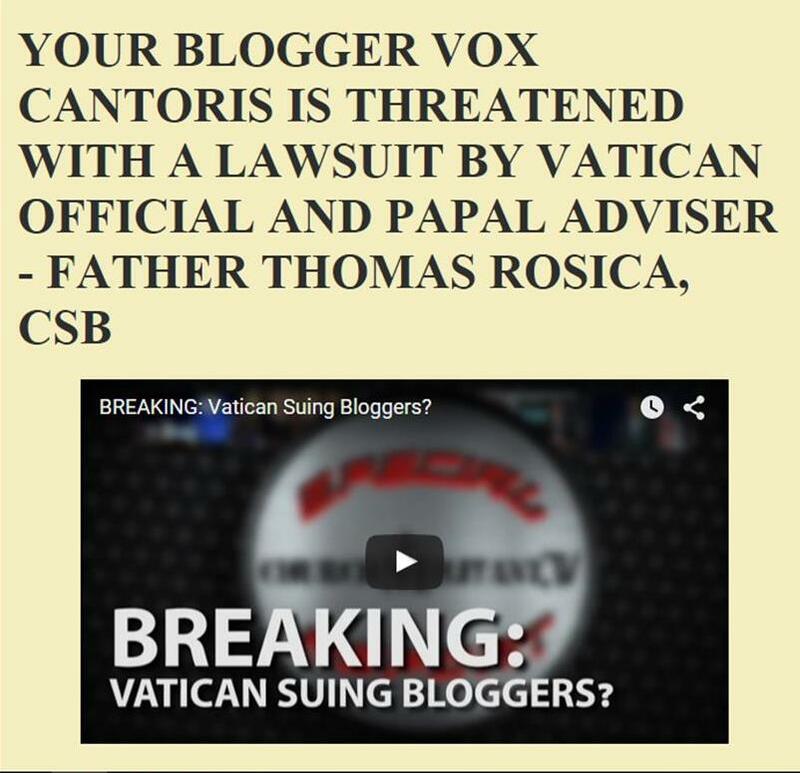 Postscript your every blog post with Blase Cupich is indecent, indeed! Here is where I left a message telling Cupich what I thought of his comments. I think his email should be flooded with mail that tells him what a disappointment he is for Catholics. Ah, if only they would Sheppard the Sheep!!! Any projections as to how we will all will handle a negative response from the Synod???? Can you picture what that Church will look like? Or maybe, we are already there!!!!! I've always wondered how the "rare, if not practically non-existent" Catholic teaching on capital punishment squares with Gen 9:6 and beyond. His Word seems to have foresaw the arguments, offering refutation of the 'ontological dignity' with His "for man was made to the image of God" reasoning. He is very clear on first degree murder, "on set purpose and by lying in wait for him" and valid witnesses to the murder, "If anyone kills a person, the murderer shall be put to death at the evidence of witnesses, but no person shall be put to death on the testimony of one witness." He also is aware of baring false witness, "They shall render to him as he meant to do to his brother" and spoke of deterrent, "That others hearing may fear, and may not dare to do such things." It is nothing more than opinion that because of the ability of "rendering one who has committed an offense incapable of doing harm" that we discard His Word. Ask 'el Chapo' about that one. Isn’t it interesting that after Jesus was falsely accused by the chief priests and elders, after many bore false witness against him, after scourged and crucified, that the Church continued to believe in God’s Word, up until the Enlightenment of the 1990's.